From the plunging cliffs and verdant vineyards of the Cape to the vast open plains of the Karoo, South Africa has more than its fair share of captivating scenery. 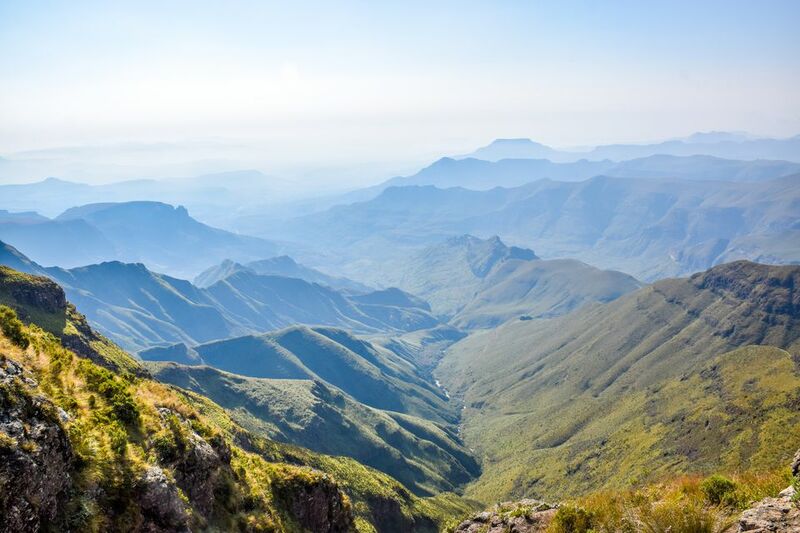 For many, however, the most beautiful area of all is the Drakensberg mountain range, which stretches all the way from the Eastern Cape to Mpumalanga Province in the northeast. Christened the Dragon Mountains by early Cape Dutch settlers and referred to by native Zulus as the Barrier of Spears, the mountain range comprises dizzying peaks and plateaus interspersed with tumbling waterfalls and lush valleys. Every year, thousands of nature lovers, birdwatchers and photographers come to the Drakensberg to enjoy its astonishing beauty. The section that makes up the border between KwaZulu-Natal and Lesotho is particularly popular with hikers, with trails ranging from half-day excursions to challenging multi-day expeditions. In this article, we take a look at three of the most popular medium-length hikes, each taking between one and two days. Before attempting any of these hikes, it's important to check the weather forecast and ensure that you have all the supplies you need to keep yourself hydrated, energized and protected from the elements on the trail. If you can't find a trail to suit your requirements on this page, check out our top picks of the Drakensberg's best short and long hikes. Part of the Royal Natal National Park, the Amphitheater is one of the most famous geographical features of the entire Drakensberg range. Its imposing cliff face runs for three miles, and towers some 4,000 feet/ 1,220 metres above the valley below (making it ten times the size of El Capitan's famous South Western face in Yosemite). The best way to appreciate the cliff's astonishing scale is to climb it. The walk starts at the Sentinel Car Park, where you'll need to sign a register before beginning your ascent. The trail zig-zags up and across the base of Sentinel peak, then wends its way into a cleft on the side of Mont-aux-Sources, close to where the Mahadi Falls plummet over the escarpment. Here, you'll find two sets of chain ladders, which lead you to the top of the Amphitheater. The climb isn't for the faint-hearted, and many find it helpful to keep looking upwards until they reach the top. However, once you get there, the view out over the Tugela Gorge and the valley beyond is indescribable. It is possible to complete this hike in a single day, with the total time from the bottom to the top and back again taking approximately eight hours. If you truly want to make the most of the experience, however, consider taking your own camping gear and spending the night at the top of the Amphitheater to witness the magic of sunset and sunrise from its elevated vantage point. Located within the Maloti-Drakensberg Park, the Lower Injisuthi Cave hike is a 10.5 mile/ 17 kilometer there-and-back trip. The walk starts at Injisuthi Rest Camp and follows the valley of the Injisuthi River, whose name means well-fed dogs (a testament to the game-rich valley, which always left the Zulus' hunting dogs replete). It is a gorgeous trail, with many mesmerizing views of the surrounding peaks. Particular highlights include the rock pools located in a narrow gully just before the caves; and Battle Cave, a major San rock art site with guided tours for you to join along the way. If you want to take the trail slowly (leaving yourself plenty of time to stop and take photographs), consider spending a night in the cave. This way, you can split the trek over two days. If you decide to do so, don't forget to fill in the over-night register at the rest camp before departure. You'll also need to take camping supplies with you, including food and a garden trowel (there are no formal bathroom facilities in the wilderness!). This trail also starts at the Injisuthi Rest Camp, but ascends much more steeply above Old Woman stream, along an escarpment that follows the edge of a feature called Old Woman Grinding Corn. The trail itself is short - a mere four miles/ six kilometers. However, its steep gradient makes the hike seem considerably longer, and you might welcome the opportunity to spend a night in one of the two caves that give the trail its name. Both feature the remains of old grinding stones, which date back to the 1800s when local clans took refuge in these caves from King Shaka's marauding impis. Long before that, the caves provided shelter for the San bushmen, thought to be descended from the very first people. This article was updated and re-written in part by Jessica Macdonald on October 19th 2017.